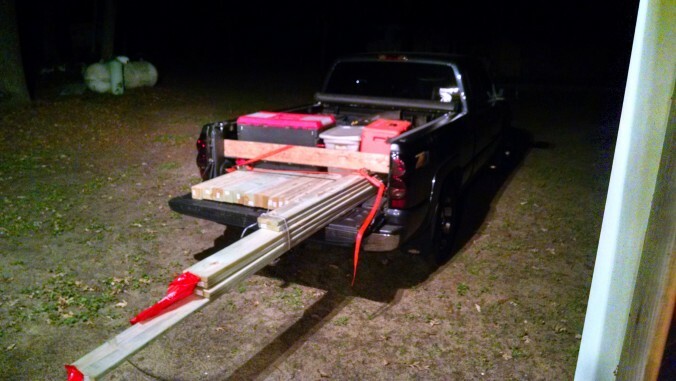 Rolled in around 9:15 pm with a loaded pickup bed once again. Menards was having one of their 11% rebate weeks on top of a sale on building materials, so I picked up all the lumber and hardware we’ll need to put up the deck railing. Since I’ll be hauling up a lawn tractor when I come back Friday and I didn’t want to unload and reload everything at home, I decided to make a quick run up. Not sure when I’ll actually start work on the railing, but all the materials are here now. I also brought jugs of Oshkosh tap water, most of my tools, the chainsaw, and some of the bagger parts for the new mower. I should have a much easier haul on Friday now. Left shortly after 10:00 after putting everything away. Short but sweet.